So the husband and I recently cut the cord. We are a cable-less household. Honestly…it’s a lot better than I thought it would be. The true test will be during football season – I might will not be such a good sport if I don’t get to wake up to College Game Day every Saturday. Anyways, the first real challenge came a few weeks ago. When the hubby and I first started dating – as in the second time we ever laid eyes on each other – we discovered we both loved the same TV show. 24. So, we rotated “hosting” 24 night by cooking for each other – obviously that’s how I hooked him! Well for those of you who are fans, you know that 24 has just started back after several years! It was very exciting news. So, on a Monday night (which was also Cinco de Mayo) – knowing that we no longer have a DVR to record such exciting television events, I found myself in a throw back state of mind. 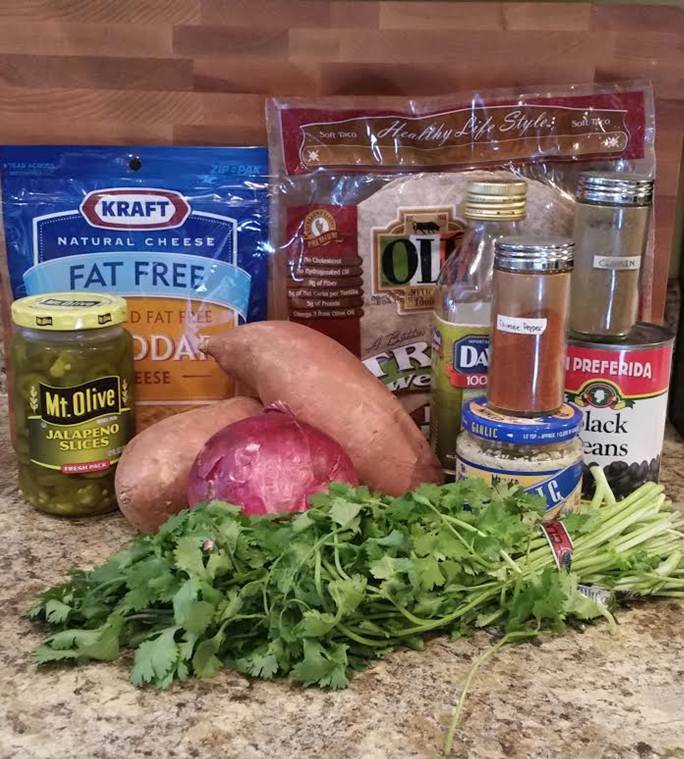 I got home late from work, was all ready to throw together our “Meatless Monday” and “Cinco de Mayo” meal while enjoying the return of Jack Bauer. Woops – forgot it started an hour early. Oh how long it had been since I had to cook during commercials – running back and forth when I’d hear “it’s back on!”. Clearly I had gotten spoiled! Luckily, the meal I planned was super simple. The longest thing is roasting the vegetables, which doesn’t take much time at all – but man it is so delicious. And it’s really filling, which is awesome. 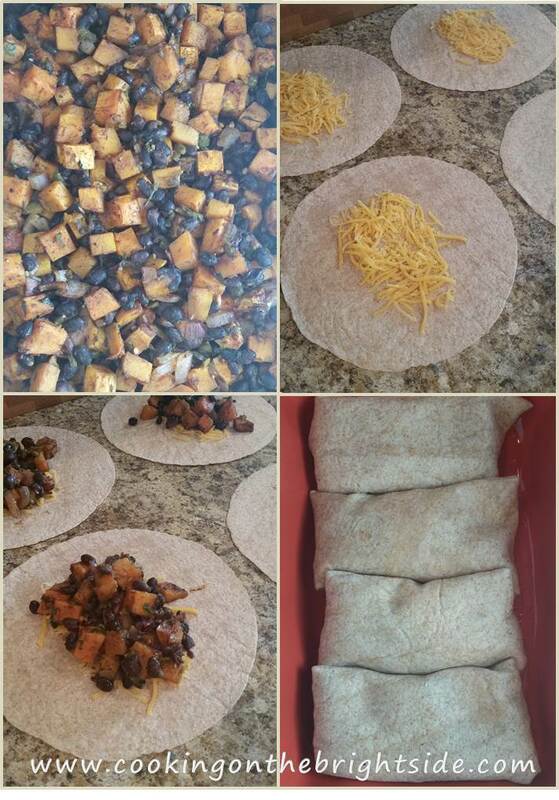 Give this a try on your next “Meatless Monday” or any other day of the week! 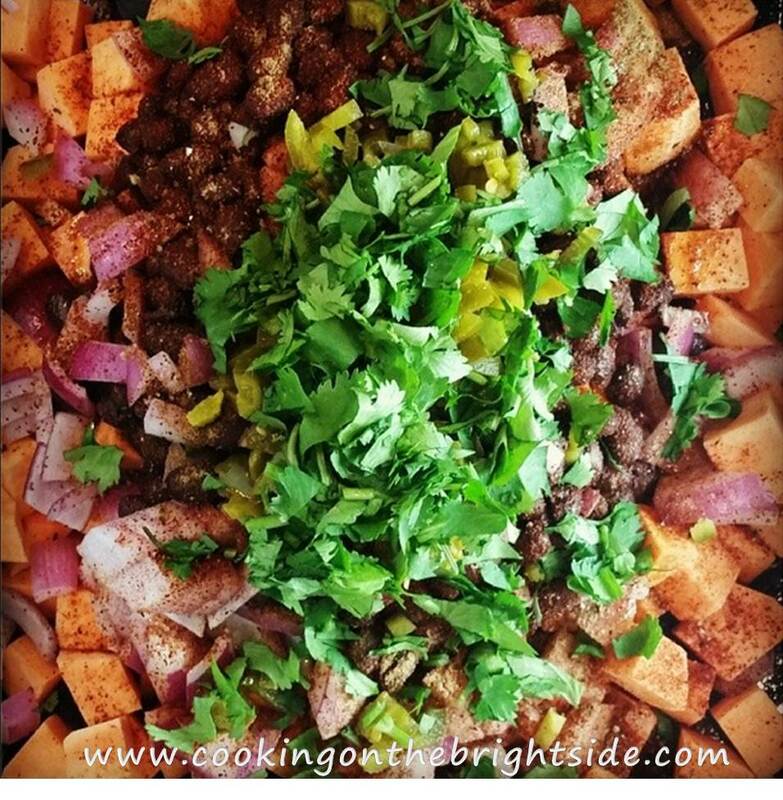 In a lightly greased roasting pan, add potatoes, black beans, onion, jalapeno, seasonings and cilantro. Toss to mix and roast for 20-25 minutes. Divide cheese evenly in the center of the tortillas. Spoon veggie filling on top, fold tortillas into the center, then tuck in the ends. Add to a baking dish and bake 10-12 minutes. Serve with salsa for dipping and enjoy! Have a happy Memorial Day weekend y’all! 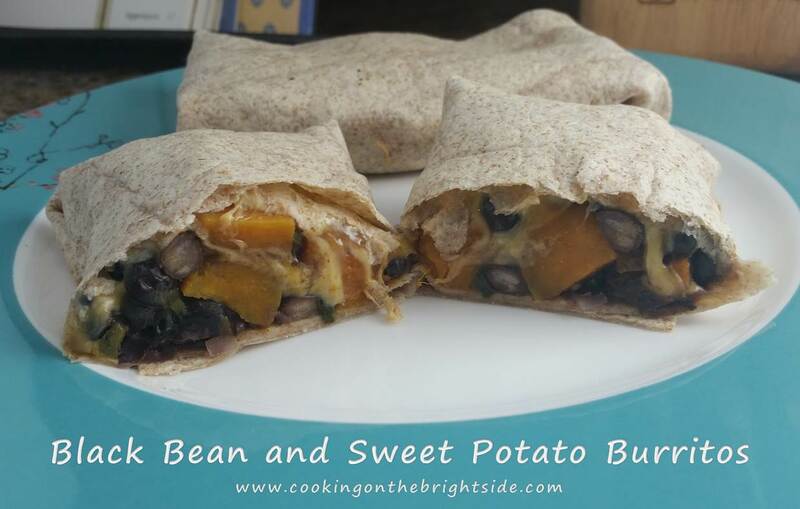 This entry was posted in Main Courses, Veggie and tagged meatless burrito, meatless monday, meatless monday recipe, sweet potato recipe, veggie burrito, weight watchers, weight watchers recipe by cookingonthebrightside. Bookmark the permalink.